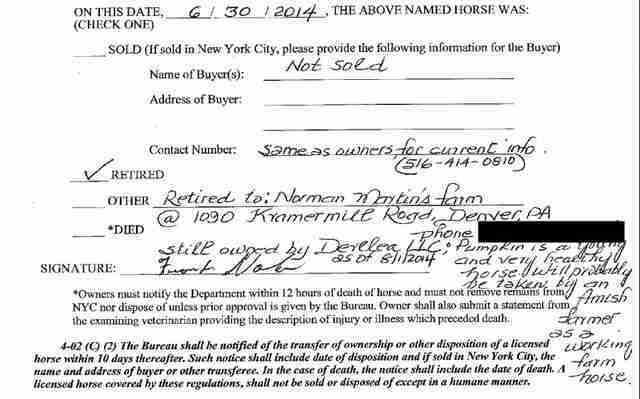 Is NYC Being Honest About Its Carriage Horse Accidents? The spin machine is in overdrive in New York City. People should know how dangerous a carriage ride really is - and generally they do, don't they? It depends on where you live. If it's New York City, you're not getting the real story. It's been almost 10 years since the horrific accident that killed Spotty. The scene, pictured above, was shocking, and the tragic accident was the impetus we needed to form the Coalition to Ban Horse-Drawn Carriages and try to end this inhumane, exploitative and unsafe trade. Now it's 2015, and we have made a lot of progress. There is a bill in the City Council, Intro 573. We have the support of Mayor de Blasio. Things are moving along. However, the odds of your knowing the dangers of a carriage ride have shrunken dramatically in recent years, thanks to an anti-ban bias by news media with political axes to grind and to a carriage trade that refuses to take responsibility for accidents. In stark contrast, a recent horse-spooking accident in St. Louis was reported accurately and fairly, and the carriage company acknowledged that a serious error was made. What happened in St. Louis has brought even more negative attention to New York City carriage trade. Let's look at the differences. A spooked horse named Bud galloped in terror down a street in St. Louis recently, with a carriage attached to his back but with no passengers and no driver. A witness caught this dangerous spectacle on video and provided it to the local TV station. What happened was this: Bud's driver had made the wrong move when he let go of the reins to help a passenger. The stable company admits that he did not follow policy, thus putting the horse, the carriage and the public in danger. When something startled him, Bud took off, desperately charging through the city - narrowly missing cars and pedestrians ... but for the grace of God. 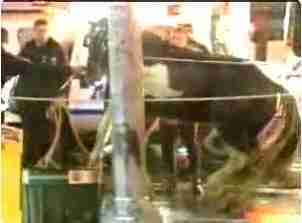 Video shows runaway carriage horse downtown. 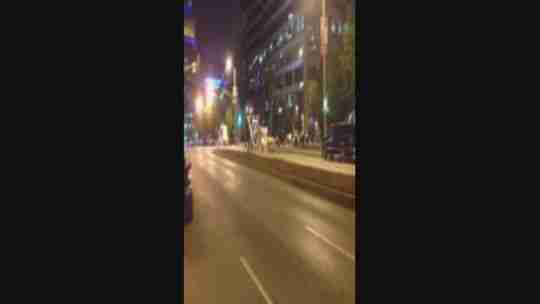 A viewer sent NewsChannel 5 (KSDK TV, St. Louis) this video of a runaway horse galloping downtown last week. Click here for the article and the newscast. Although Bud got back to his stable with no injuries to anyone, the KSDK TV news announcer said with no uncertainty: "On the upside, no one was hurt. On the downside, this could have ended very badly. Someone could have been killed, as the company fully admits. As the video played showing the horse wildly tearing through the streets, the announcer continued: "The horse does not know the rules of the road (even though heading back to the stable). When it veers around another carriage into the lane of oncoming traffic, things could have ended badly." A spokesperson for the St. Louis Carriage Co. didn't shirk any responsibility, saying the driver "absolutely" made a serious error. "This was a highly dangerous situation that should never have happened," manager Sharon Burnett, a former driver herself, told KSDK. The station reported the stark truth: "Had there been an accident, the carnage would have been undeniable, and the loss of life highly probable." The Coalition to Ban Horse-Drawn Carriages has maintained for years that horses do not belong in the crowded and congested traffic of New York City pulling flimsy carriages and working punishing hours. This includes within Central Park and around the park, which has been the scenes of many accidents. It is foolish and irresponsible for the city to allow this dangerous industry to continue, putting the public at risk. Murphy's Law: It is only a matter of time before a deadly accident happens here. New York City has dodged the bullet so far, but serious and deadly spooking accidents have happened the world over. 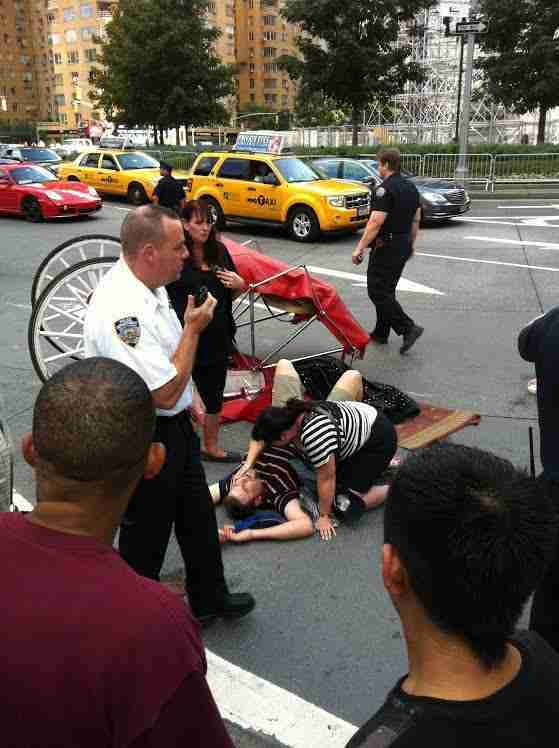 Horse-drawn carriages are accidents waiting to happen. This is why we started the campaign in 2006 to shut down this inhumane and unsafe business, a diverse effort that finally culminated in the introduction of a bill to ban horse-drawn carriages. The bill (Intro 573) was introduced into the City Council in December 2014 and is in the Transportation Committee. If the truth is allowed to come out and is accepted, there will be a ban. It is past time for this obsolete business to go the way of gas lamps. The accident involving Spotty, a 5-year-old gelding, occurred Jan. 2, 2006, on 9th Avenue at 50th Street in midtown Manhattan. Spotty had been returning to his stable in Hell's Kitchen. Something spooked him and he bolted, terrified, into traffic, throwing his driver, who ended up hospitalized in a coma. Spotty crashed into a station wagon, injuring two men inside and sending them to the hospital. Spotty lost his life. Incidentally, the Daily News reported that the carriage driver was a former bagel shop worker with little horse experience. Similar accidents have happened in New York City, as they have in St. Louis. But the big difference is that when it happens in New York City, unlike St. Louis, the owners and drivers make up excuses and never take responsibility. Pumpkin drags carriage through Central Park, hits cab. What happened in St. Louis brings to mind Pumpkin, who on June 9, 2014 was yet another runaway carriage horse in New York City - and three weeks later was removed from the trade and sent away. After dragging an empty carriage through Central Park, poor terrified Pumpkin stopped only when the carriage caught in the door of a taxi cab. This happened on a late spring afternoon, with people everywhere, during the peak of rush hour. Pumpkin had been left unattended and this accident never should have happened. Also, when a horse weighing 1,200 pounds or more spooks and runs wild, anyone in his path is very much in danger. Then, as now, the New York City carriage trade went into overdrive trying to spin this near-miss into a positive tale. "What you saw is the industry's professionalism," carriage driver Stephen Malone told the Daily News. "We knew where the horse would go, corralled it [sic], and brought it back to the stable." Never mind that this unnecessary incident endangered the horse and the public safety, or that it would never have happened had the carriage driver been paying attention to Pumpkin, who was reported to have slipped from his bridle. Three weeks later, Pumpkin was sent away to work on an Amish farm. Another accident similar to the one in St. Louis happened in New York City on Aug. 16, 2012, when a horse named Oreo was pulling a carriage on Central Park South with two passengers, and he was spooked by a loud noise. The media reported that the driver got down from the carriage to try to control him. This was the wrong move, because by doing that, the carriage driver was no longer able to control the horse. Oreo went berserk and witnesses say he was terrified - rearing and licking his face. New York Times, Aug. 16, 2012: "3 Are Injured When Horse Sheds Coach in Manhattan"
WNBC News, Aug. 17, 2012: "Spooked Horse "Oreo" Recovering After Columbus Circle Accident"
Daily Mail, UK, Aug. 16, 2012: "Runaway carriage chaos as horse tosses tourists and smashes into cars near New York City's bustling Columbus Circle "
I turned around and all I saw was a horse going wild with the carriage attached to it and two people were sitting in the carriage. The horse was just going crazy. There was no driver. The driver gripped the reins as tight as he could, but the horse was too strong and pinned him against the wall. The animal galloped along the sidewalk for several blocks in the direction of its stable before it crashed into a parked car. The force of the accident caused the carriage to break apart and the tourists were thrown to the ground, the man hitting his head in the fall. Oreo continued several long blocks to 9th Avenue when he was corralled by police and darted with a tranquilizer. From the site of the accident to 9th Avenue, he had to go through a crowded thoroughfare. He had superficial cuts on his face; the driver and passengers were injured. Just as in St. Louis, it could have been much worse. At one point, Oreo was running up on the sidewalk, and if he had trampled someone, that person easily could have died. But unlike in St. Louis, there was no admission of the danger by the carriage trade. Instead the driver's error and the seriousness of the accident were glossed over, which is the norm. "Oreo did exit Columbus Circle at Broadway," said Christina Hansen of the Horse and Carriage Association of New York City. "He made a left at 60th and a left on 9th Avenue, which is the path he takes home everyday. So he was headed back to the stable." And this: "Those who would use and exploit this unfortunate incident to again pick up the drumbeat to 'ban the carriages' need to avail themselves of our stellar, decades-long safety and care record," said Eva Hughes, vice president of the Horse & Carriage Association of New York City. She continued on, boldly twisting the reality into a self-promotional ad for the carriage trade: "While pedestrians and others are killed nearly everyday in New York City by cars, our accidents are not only few and far between, but we have had only three equine deaths in 30 years due to vehicular accidents, and zero human fatalities," said Hughes. This is super spin, because there have been many accidents in New York City. 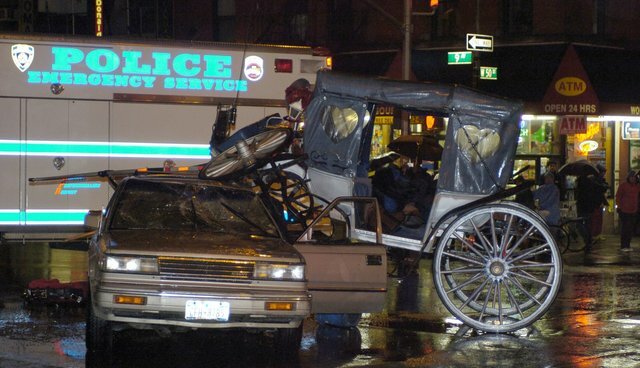 Carriage drivers are not required by law to report accidents to the NYPD or the Department of Health. Many horses have died - technically many did not actually come into contact with a motor vehicle, but their death was public and tragic nonetheless. In 2007, Smoothie; 2006, Spotty and Juliet; 2011, Charlie. Those are just the public deaths since we started this campaign in 2006, and many more precede that date. It is so disingenuous to say "zero human fatalities," because New York City has most definitely dodged the bullet, for now. 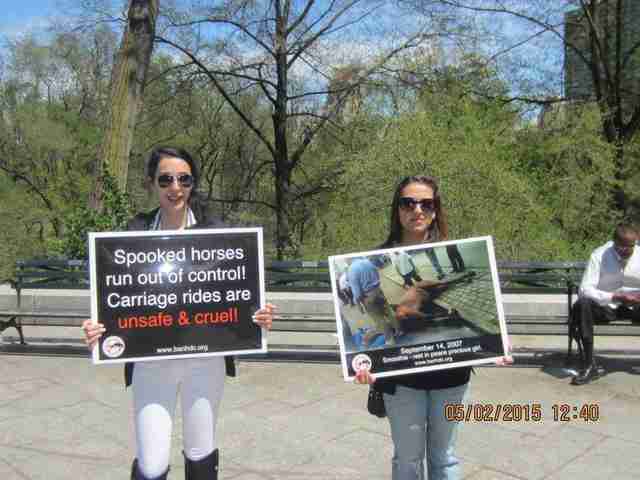 People have died in carriage horse spooking accidents elsewhere. In 2010, a bystander in Salzburg, Austria became the victim of a spooked horse when she was trampled on the sidewalks. This scenario could easily have happened with Oreo. Those who speak for the New York City carriage trade continue to deny anything is wrong with what they do and they continue to make excuses, bashing and berating the Mayor and anyone who disagrees with them as liars and worse. They dismiss any criticism by saying that those detractors do not know anything about horses. Only they are the experts. They call us liars, but it is only too obvious that it is a classical case of psychological projection, besides being a campaign tactic. They claim that only they tell the truth, only they have the facts -attributing and deflecting those lies and misinformation to others. This lack of acceptance of reality will be their downfall. You can help by taking action and contacting the City Council. It does not matter whether you live in New York City or elsewhere. See what you can do by clicking here.